You knew it wouldn't be long until you saw another quinoa recipe pop up on good ole Ice Cream & Wine, right?! So. In. Love. 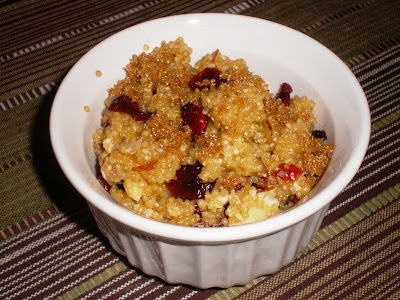 In case you missed my complete adoration for quinoa, you can check it out here. Absolutely versatile and always delicious. Seriously, I just don't think you can mess up quinoa. It's like pasta - anything you add to it will be tasty. I promise! So the very next morning after I made Salsa Quinoa, I tried my hand at breakfast quinoa. There are MANY recipes out there for breakfast quinoa. 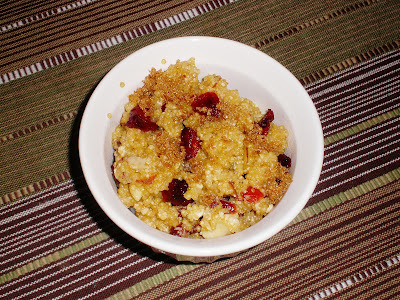 After scouring the blogosphere and taking notes, I came up with this mighty fine maple quinoa. Holy. Yum. Please, I'm begging you, make this recipe. Now. You will love me forever. In a small saucepan, bring the milk to a boil. Reduce to a simmer immediately and add in the quinoa. Cover and cook until the milk has been absorbed - roughly 15 minutes). Pour into a small bowl and add maple syrup. Stir to mix well. Add sliced almonds and cranberries and stir well. Sprinkle with a bit of brown sugar, if desired. Enjoy!